Planet Barbecue’s most accomplished pit masters are what Steven calls “process-oriented.” In other words, the convenient push-button ignition and regulated fuel flow of gas and pellet grills and smokers hold little allure for them. They take immense pride in building a noble fire with wood and/or charcoal and maintaining it for the duration of the smoke session, sometimes dusk to dawn (or until the beer runs out). But the other night—as in the middle of the night—it occurred to me, as I pulled jeans over my sleep pants, why so many Hall of Famers are Southerners: They don’t have to leave their warm beds in 20 degree temperatures or slog through 18 inches of snow to feed the fires. Of course, there are reasons beyond creature comfort for wanting to prolong the burn. Maybe you promised to bring brisket to work in the morning and can’t afford to stay up all night. Or it’s a workday, but guests are coming at 6 p.m. for your famous pulled pork. Fortunately, there are several methods for building a fire capable of sustaining itself for several hours, anywhere from 6 to 18. All are covered in Steven’s terrific book, Project Smoke. Here is a summary. The Ember Spread Method: Intersperse unsoaked wood chips or chunks among the unlit charcoal. Place a paraffin fire starter in the center and position 3 coals over it. Light the starter. Once the 3 pieces of charcoal are lit, close the lid and adjust the vents to obtain a temperature of 225 to 250 degrees. The lit coals will gradually ignite the unlit coals and wood giving you a slow, steady burn and hours of smoke. 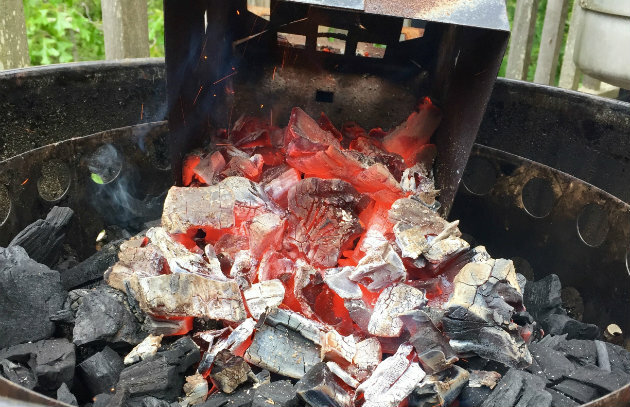 The Top-Down Burn Method: Here’s another great way to achieve a protracted burn, and it works with both lump charcoal and briquettes. Arrange three-quarters of the charcoal in the firebox, interspersing it with unsoaked wood chunks or chips. Light the remaining coals in a chimney starter. Pour the lit coals on top of the unlit coals, arranging a few more wood chunks or chips on top. The lit embers will gradually light the remaining coals from top to bottom. The Minion Method: Similar to the Top-Down Burn Method above, the Minion method is associated with a competition barbecuer named Jim Minion. He always uses briquettes, about eight pounds. Fill the firebox with unlit coals, interspersing them with unsoaked wood chips or chunks. Create a depression in the briquettes. Arrange a few (four to six) lit embers on top. Burns using this method can last 8 to 12 hours. A variation on the snake method is the Domino or Fuse Method where you make a circle or coil of briquettes in a single orderly row, each briquette stood on end and leaning against the next one in the series (like a row of dominos) with wood chips sprinkled on top or wood chunks arranged at intervals. This method is great for maintaining cold smoking temperatures for several hours. Don’t pile charcoal too deep in the firebox or the ash can choke out the fire. Two coals deep is sufficient. Regardless of which method you use, know that a number of factors will influence burn time. Among them are wind, outside temperature, the thickness of your grill/smoker walls, and the type of fuel you use. Charcoal briquettes are usually formulated to burn for about 1 hour at a steady temperature, generally hotter than smoking temperatures. There are differences between brands, so in the interest of fire management, it’s helpful to find a brand that works for you and stick with it. Ditto for lump charcoal, which being a natural product, is less predictable. A good online resource for comparing brands of both is nakedwhiz.com. Once you’ve set up your grill or smoker using one of the methods described above, adjust the vents, then close the lid. Avoid the temptation to keep checking on the fire or repeatedly chasing specific temperatures with the vents. Have patience. Make adjustments only when it’s clear the temperature is too high or too low. A long-range remote thermometer, preferably Bluetooth enabled, is a handy tool if you routinely do long cooks. We like this one from Maverick.